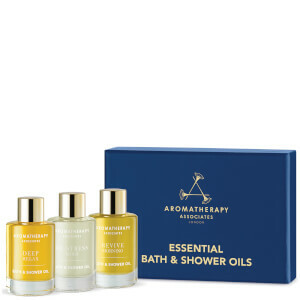 Soothe and calm the body and mind with The De-Stress Edit from Aromatherapy Associates. Containing five stress-relieving, mood-boosting products, the indulgent gift set will help to nourish and relax you from top to toe. Experience the powers of an intense pulse point therapy expertly designed to inspire positivity and promote well-being. Blending Frankincense, Wild Chamomile, Rosemary and Petitgrain, the soothing formula rejuvenates a busy mind and body, whilst balancing mood and relieving stress to leave you feeling calmed and restored. Perfect for travelling or use on-the-go, you can melt away tensions of everyday life whenever you desire. Lift tired spirits with a clarifying and focusing bath oil that helps to relieve stress and anxiety while refreshing the mind and body with the calming blend of Frankincense, Petitgrain, Wild Chamomile and Rosemary Essential Oils. Energise and revive muscles with the warming and fatigue-fighting blend of rosemary, black pepper, lavender and ginger. Ideal for use after physical activity or a long, tiring day. Deeply rejuvenate your complexion with a luxurious formula that helps to calm and comfort dry, sensitive skin. Harnessing the powers of Safflower Ceramides and Strawberry Seed Oil, the regenerating treatment strengthens and repairs, whilst a blend of Chamomile and Evening Primrose Oil relax the skin and senses. Helps to minimise redness and calm irritation for long-lasting comfort.